As a successful candidate for the Digital Scholarship Internship, you will receive training in multiple steps of the digital collection and software development process, working with librarians, library technicians, archivists, software developers, and systems administrators to develop and promote digital collections and digital scholarship tools. You will help in the next big push to increase accessibility to some of our most sought after special-collections, all while developing an enviable portfolio to attract future employers. You are interested in the work of libraries. This position would be particularly beneficial for a recent graduate from an MLIS program (within the last year) but that is not a requirement for the position. You are comfortable with technology and excited by its possibilities, and you have the confidence and drive for continual learning. You are an advocate of open source and open access data, and are passionate about diversity and accessibility. Located at the east-end of Toronto, Scarborough is ethnically diverse, full of beautiful natural scenery (part of Toronto’s ravine system) and home to a well-respected food scene. The University of Toronto Scarborough’s new Aquatics Centre and Field House opened in 2015 for the Pan Am/Parapan Am. Games, representing a major investment in amateur sport. UTSC is also accessible by public transit to the Durham regions as well as downtown Toronto. There is the potential to have some costs covered for those interested in relocating to Ontario for this opportunity. We encourage applications from Government of Canada’s job equity groups (i.e. youth with disabilities, Aboriginal youth, visible minorities and new Canadians). We are proud to announce the 7.x-1.10 release of the Islandora Oral History Solution Pack. This module supports the association of transcripts in XML and/or WebVTT format with Audio and Video files, and the display of time coded text information in a viewer, where cues are highlighted as the media plays. This module has been tested against the 7.x-1.10 version of Islandora and should work with this release, and with the Bartik and Bootstrap Business themes in both Chrome and Firefox. The following small issues have appeared from time to time in our testing. Each item in the list below is linked to the relevant Github issue. We welcome reports from others experiencing these issues. The following small issues have appeared from time to time in our testing. Each item in the list below is linked to the Github issue. We welcome reports from others experiencing these issues. - Closed Captioning appears at the top of the screen when annotation features are turned on for multimedia However, there is a partial work-around to this behavior. The University of Toronto Scarborough Library's Digital Scholarship Unit is hosting a Lunch and Learn event on February 23rd from 1:00-3:00pm online and from 12:00-3:00pm in-person at the University of Toronto Scarborough Library. Anyone who is interested in attending the event is welcome to sign up here: https://goo.gl/forms/4vfqyCFnaDrGEGWr2. The event is going to introduce participants and provide the latest updates on the next generation of Islandora called Islandora CLAW. Islandora CLAW uses the latest repository technologies and is a total re-architecting of the interaction between the various pieces, acting as middleware for not only Drupal 8.x and Fedora 4, but also Solr, Blazegraph, and any microservices added to the stack. The DSU will also be giving a presentation about the Dragomans Renaissance Research Project, an experimental digital humanities project that curates over a decade of research for Professor Natalie Rothman. The platform is built the principles of a Linked Data Platform (https://www.w3.org/TR/ldp/) and models the data using the Resource Description Framework (https://www.w3.org/standards/techs/rdf#w3c_all). This framework allows for robust querying and search and allows for the expression of complex relationships between different data points. We are hoping that this event will spark discussion about the future of digital repositories and to ask questions and provide their thoughts about Islandora CLAW. We also hope that participants will learn more about the work done in the DSU within this new infrastructure. We also hope through our discussion to find out how others are engaging in the Islandora community, how they want to participate in the future, what repository technologies they currently support or want to support. Note: You will be asked to download the Zoom application if you haven’t done so already. It is best to do so in advance of the event. It's the new year which means we're getting our systems ready for the new semester! This semester, we will be working with Professor Anne Milne again in ENGD43 to support the annotation of William Hogarth's series of six pictures, Marriage a la Mode. Annotations are done using Islandora Web Annotations, a utility module developed by the DSU that lets you add text and other media to images, video, and audio content. Nat is an Islandora CLAW Committer! The Islandora CLAW committers have asked Natkeeran Ledchumykanthan to become a committer and we are pleased to announce that he has accepted! Nat has worked with the project for a while now and has contributed both code and documentation to Islandora CLAW. He’s been very active in our development workflow, reviewing and testing pull requests and filing issues for bugs he encounters. Thank you Nat for all the time you’ve put into this project. We are all looking forward to working with you as a committer and feel that you are a valuable addition to our team. 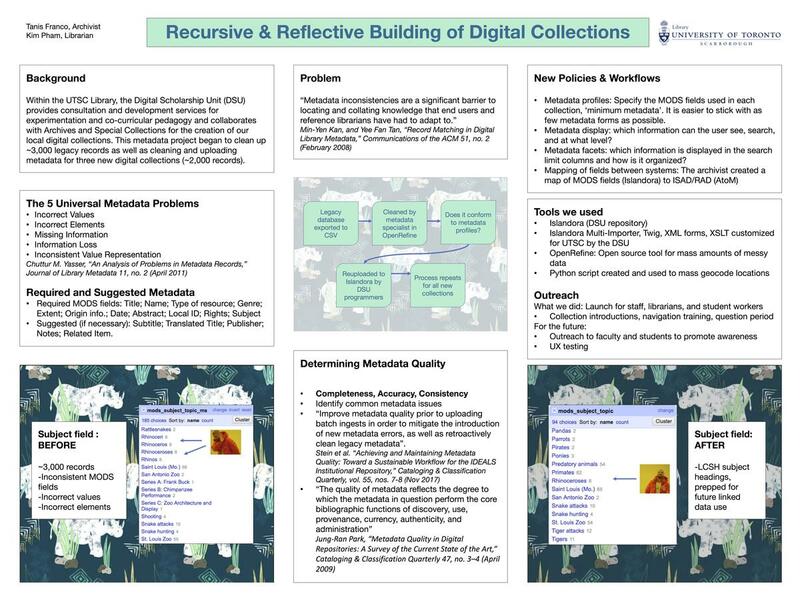 As part of the library's commitment to this year's JHI-UTSC Digital Scholarhip Fellow (Andrea Charise) Angela Hamilton and Kirsta Stapelfeldt produced a set of guiding questions, now generalized as Questions to guide Project Development in Digital Scholarship. Hopefully this may be of use to others new to Digital Humanities work! We are proud to announce that beginning Fall 2018, partners at the University of Maryland, the University of South Carolina and the University of Toronto Scarborough will begin work on a prototype for the Early Modern Songscapes platform. The project is hosted at UTSC Library’s Digital Scholarship Unit and represents a development partnership between the DSU and the Maryland Institute for Technology in the Humanities. This first phase of the project will launch early in 2019, to correspond with the annual conference at the U of T Centre for Reformation and Renaissance Studies. The Early Modern Songscapes project aims to develop an intermedia online platform to support scholarly investigations early modern English song. The project has three primary goals: To provide tangible insight into the flexibility of song as a genre by tracing individual lyrics and musical settings that moved through different textual and performance contexts in sixteenth- and seventeenth-century England; To develop a digital interface that can productively animate the acoustic and visual facets of early modern English songs; and To generate an interdisciplinary and collaborative hub for scholars, students, and performers of sixteenth- and seventeenth-century English songs that can also function as a resource for the music-loving general public. While there is a great richness, elusiveness, and ambiguity of the term “song” as a generic category in the period, Early Modern Songscapes will focus on “ayres,” songs composed with a primary vocal line and usually performed with instrumental accompaniment. Popularized in the late sixteenth century with the published lute song collections of John Dowland and Thomas Campion, the ayre evolved in the first half of the seventeenth century into the declamatory vocal style perfected by Henry Lawes. The genre’s emphasis on clear communication of text makes it an ideal case study for the rich interplay between music and poetry in early modern England. Although the ayre was a vital component of sixteenth- and seventeenth-century musical soundscapes, surprisingly few studies have attempted to use intermedia resources to capture the performance-based dimensions of the genre. Our platform aims to complement and build on comprehensive databases such as The Early British Broadside Ballad by providing an online “songscape” that animates the ayre’s multi-dimensionality by juxtaposing archival sources, contextual essays, and audio and video clips. An intermedia approach to the early modern ayre will make the facets of song that often seem the most intangible—its sonic fleetingness, its movement through varied textual and social settings, its connection to the performing body—a tangible focus for critical discussion. Early Modern Songscapes also aims to provide a centralized and methodologically playful forum for performance- and sound-oriented conversations about song that are currently taking place in literary and historical studies, in musicology, and in gender and cultural studies. The Digital Scholarship Unit is very supportive of open access movements and open source software. We prioritize publication in Open Access journals such as Code4Lib and use and develop Open Source software on Github . So, here’s to Open Access Week and all those celebrating and promoting resource sharing as the best way to create and share knowledge. The ideological links between Open Source and Open Access are well served by Open Access Week, which takes place at the same time as Hacktoberfest. The 16th Tamil Internet Conference was held at UTSC in late August, and two DSU personnel gave presentations on Digital Scholarship Tools and Techniques and Towards Building Ontologies for Linked Open Data in the Tamil Context (presentation in Tamil). Learn more by accessing the slides via these links in Tspace. We are always excited to see the students return to campus for the start of fall term. This fall, the DSU is involved in several pedagogical intiatives in the classroom. We're proud to support the Nearby Studies initative through Chris Berkowitz by maintaining a custom course website, through which students submit Oral Histories to a growing corpus of material covering the lives of locals as well as write and comment in a cross-disciplinary space. We are also happy to be present in Anne Milne's English courses this fall, through the DSU-hosted Hogarth Project. This project will be adding another set of images for students to annotate. Jayeeta Sharma will also be using materials hosted on her EHRN site in the classroom this fall. We have also heard from others who are using the materials from our Pedagogy Project in the classroom this year. We are grateful to the UTSC Library Liaisons for all of their hard work making these collaborations a success. If you are interested in seeing how DSU infrastructure or materials can help further digital pedagogy in the classroom, contact your Liaison Librarian. The DSU have been collaborating with the Islandora CLAW team by taking part in the discussions, providing use cases, participating in the sprints and contributing to testing. For the last two weeks, Natkeeran and Marcus have also been taking part in the Islandora CLAW Sprint. During the spring, Nat developed an ansible role in order to install activemq for the claw-playbook that's used to easily install Islandora CLAW. Islandora is a Free and Open Source Software that several institutions, companies and individuals collaboratively build. If you are interested in learning more about the platform or contributing to its development, please contact us or the CLAW team. Islandora CLAW (CLAW Linked Asset WebFramework) is a next generation digital repository platform. It is being designed to work with Drupal 8, Fedora 4, Apache Solr, Blazegraph and other related technologies. It is a full fledged Linked Data application platform. We are very excited to see the initial release of the Move to Islandora Kit tool (v0.9.0). Our very own developer Marcus Barnes along with Mark Jordan from Simon Fraser University are the current maintainers for this module. The Move to Islandora Kit is an extensible PHP command-line tool for converting source content and metadata into packages suitable for importing into Islandora (or other digital repository and preservations systems). We find it to be a very powerful, extensible tool with a lot of potential applications and uses for migrations across many different systems.